" East Blowering Station"and "West Blowering Station"
North side bounded by Mr Shelley's grant of land (originally taken up by Mr James Hannibel Rose, Run No. 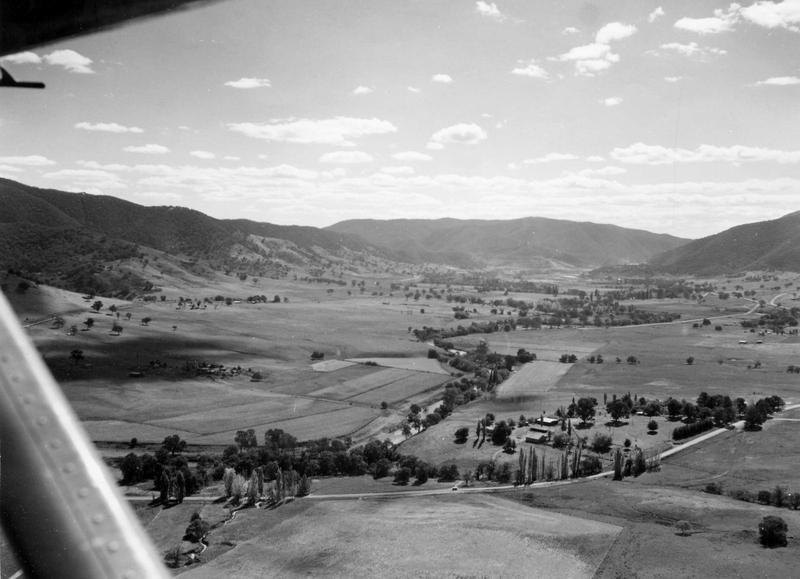 176 "Tumut Plains") and the McAlister's ("Wereboldera" marked line by Commissioner: south by Mr Wilkinson's marked line and Tumut River: east high chain of mountains: west dividing chain of mountains.N.B. - This run has been transferred, with the sanction of the Government, to J C Whitty in whose name the Lease will accordingly be prepared. 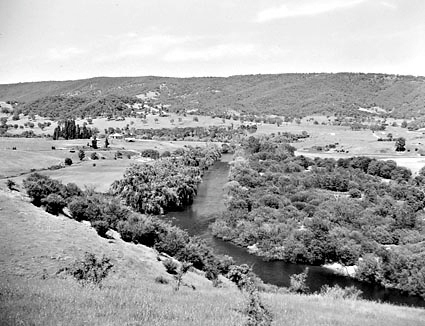 1906 - Closer Settlement at Tumut. The East Blowering Estate, comprising 479 acres of freehold, 6223 acres of C.P. land, and about 28,000 acres Pastoral Holding, situated 12 miles from the Tumut Railway Station, is to be subdivided and sold by auction for closer settlement on November 1. The country has seven miles frontage to the Tumut River, is watered by five other permanent running creeks, and is suitable for grazing, mixed farming, and dairying. - (Ref- Australian Town and Country Journal (NSW : 1870 - 1907)(about) Previous issue Wednesday 26 September 1906). To the Last Owners Oliver Moreton & Honor Lodge, - April, 1933 Resumption in 1966. "Poplar Farm" Home - sheds - dairy site 1951. All on the left of the Tumut River. To Joseph & Jane Lambert - then in name Jane & George Francis Lambert(First son from Joseph's first marriage) & J G Ware of UK, 1872 TO 1907 - (Died). Aboriginal cricketer Johnny Taylor who died of measles in 1875 had worked as a stockman on Blowering Stn. Owen Hartshorn - worked with Rolf Bridle on Poplar Farm. Noel Robinson - was a stock worker. 34 lots (35,acre 1 rod to 145 acres), on and near the right bank of the Tumut River, below the village of Talbingo, and between 14 and 20 miles from Tumut, on the road to Kiandra,- (Ref- GOVERNMENT GAZETTE, NO. 168. - Empire (Sydney, NSW : 1850-1875) Tuesday 13 August 1861). 1901 - Mr. Bland Clayton reports having leased, for a period of five years, the East Blowering Estate, and having sold all the stock at present thereon to Mr J. H. Hume, of "Collingwood," Gunning, at satisfactory prices. Mr Hume, who is we believe a very enterprising man, is a son of Mr. Home, the owner at one time of Eleislie. - (Ref- The Tumut Advocate and Farmers & Settlers' Adviser (NSW : 1903 - 1925)(about) Previous issue Tuesday 28 July 1903 Page 3). 1904 - Mr. Badgery of Pitt, Son & Badgary, Sydney, acting in conjunction with Messrs Wilkinson & Walker, Tumut offered the West Blowering Estate, also Jounama Estate, Yarrangobiliy, at O'Dea's Royal Hotel, on Wednesday, but no offers were received for either property. - (Ref- Adelong and Tumut Express and Tumbarumba Post (NSW : 1900 - 1925)(about) Previous issue Friday 2 December 1904 Page 2). 1906 - The East Blowering Estate, comprising 479 acres of freehold, 6223 acres of E.P. land, and aboutt 28,000 acres pastoral holding, situated 12 miles from the Tumut Raliway Station, is to be subdivided and sold by auction for closer settlement on November 1. The country has seven miles frontage to the Tumut River, is watered by five other permanent running creeks, and is suitable for grazing, mixed farming, and dairying. (Ref- Australian Town and Country Journal (NSW : 1870 - 1907) Wednesday 26 September, 1906).